The Simpsons first aired from 1987 to 1989 as a series of animated shorts on The Tracey Ullman Show. Unofficially known as "Season 0," the original 48 ad-bumpers kicked off what is now well established as one of television's all-time classic series (which premiered on the then-fledgling FOX network in December 1989). It is currently in its twenty-ninth season, making it the longest-running prime-time sitcom in Amercan TV history (worldwide that honor belongs to Last of the Summer Wine, although the latter has fewer episodes, with 297 while The Simpsons has surpassed 500). 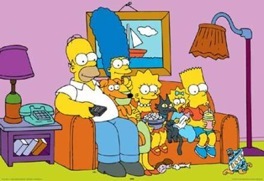 Depicting the animated adventures of the upper-lower-middle class Simpson family, the show started as a parody of Dom Com conventions, but quickly incorporated elements of social satire, pop-culture references, and a mix of highbrow and lowbrow humor that has kept it popular year after year. Originally the show focused most of its attention on 10 year old Bart Simpson, but after the first 3 seasons his dad Homer gradually took on being the most consistent protagonist. A feature film (creatively titled The Simpsons Movie) was released in summer 2007. Perhaps not surprisingly, reactions from fans were mixed, with some fans claiming it to be on the level of the Golden Age episodes, and some considering it just an extra long Tarnished Age episode. Nevertheless, the film was a huge financial success and recieved a positive response from critics, earning a 89% Fresh Rating on Rotten Tomatoes and getting a 80 on Metacritic. In 2009 the show began its 21st season, officially dethroning Gunsmoke as the longest running prime-time American television series of all time (although Sesame Street, among others, still retains an even longer run with 40 seasons). Krusty's Fun House, released in 1992-1993, originally named Rat-Trap before being reworked as a The Simpsons title. The Super Nintendo Entertainment System and Sega Genesis versions were named Krusty's Super Fun House. It was essentially a maze game. Bartman Meets Radioactive Man, a platform game released in 1992. Virtual Bart, despite its name actually released on the Super Nintendo Entertainment System and the Sega Genesis, not the Virtual Boy, in 1994. Another Gameplay Roulette game, with each level having a different theme. The Itchy & Scratchy Game, a platform game starring the titular duo (and not Bart for once), released in 1993 and 1995 - you play as Itchy and battle against Scratchy. The Simpsons Wrestling, a, well, wrestling game on the PlayStation released in 2001, featuring the voice actors from the show and unique special moves for each character. The Simpsons Skateboarding, a... well, it should be obvious. Released on the PlayStation 2 in 2002.